Before I start with the progess of these weeks, I want to tell you about a special event. The guys at Metroid Headquarters are celebrating their 7th anniversary, and they´ll be doing a 101 hour Metroid Marathon, streaming live playthroughs of all the Metroid games on their hardest difficulty, with 100% items and scans. These awesome guys will be collaborating with Child´s Play, the famous and respectable charity. The marathon will start on Monday, July 11th at 8pm CST. For those who will watch it, I´ll be ocassionally on the chat room (I´ll try to tune in the entire Metroid 2 part). Regarding AM2R, there was some progress. Mostly playtesting and balancing issues with many enemies. Some Alpha Metroid fights were tweaked, mostly the first ones. Fighting Alphas with a limited supply of missiles and only 1 energy tank can get pretty hectic. A new save station was added near the bottom part of the first area, for those who want to retreat from any of the Alphas there and restock. Well, this post was pretty early. Be sure to stop by the chat room if you watch the marathon. And I might have to check out that metroid marathon, sounds cool. nice update doc! i hadn't expected one so soon. good thing i checked the new posts in the forums! :D hope everything goes well, have fun! Thanks for the advertising our marathon, I'll see you there doc! Hey Doc, are you all but finished with the layout/areas and creature sprites and placement/movement then? It sounds like you have started testing and script revising, which means you are indeed REALLY close to release. If that's the case, that is some FANTASTIC work you have done. I am super pumped to play this! I feel like Eric Cartman from South Park. I know it's almost out and I only have to wait a little longer, but I will still be looking for a time machine to go to the future to get my hands on a copy and be thrown into the middle of a war between technologically advanced beavers, and people who praise science. Remember? "Praise be to science!" It's awesome that you're playtesting the game and fine tuning the difficulty. So many indie game projects have no concept of a ramping difficulty level, and are just tought as nails from start to finish. It really sounds like this is going to be professional quality stuff. Keep it up! AM2R will be so awesome!!!!!!! If you're still looking for a name, why not just call it AM2R meaning Another Metroid 2 Remake. Everyones known it as this for quite a while. Why confuse people with a different name for a game that has been public with this name since 2008? Even something like Advanced Metroid 2 Remake could cause confusion. And to be honest, I personally like the name Another Metroid 2 Remake. I'm just stating my opinion but I hope you will consider it. 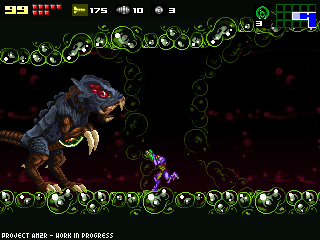 Is there a "Metroid: Extermination" yet? I know it sounds corny, but that's practically the whole of the game: extermination of a species. Yeah, the marathon's gonna be great! And so will be AM2R, once it's ready. It's good to see that nothing's stopped this project yet, and the good Doctor is just working his tail off providing entertainment for us starved fans. Y'ALL SAY THANK YOU! Images of Chucky are now flashing in my head. I really need to rewatch that movie. Whoever talked about the marathon starting on the 8th, that's another one. MHQ clearly has a countdown for the 11th. From the looks of your progress, I'd say it's not much longer until release. I'm sure you have plans regarding when you're gonna release it, but if I had to take a guess, I'd say the release will be either during the holidays or during the first half of next year. Keep up the good work, doc. Now that I think of it, the destruction of enemies was a bit weird in the demos. I don't mind it though. i meant like a map of all the completed areas, sorry not multiple screenshots. just a map that shows a completion percentage.